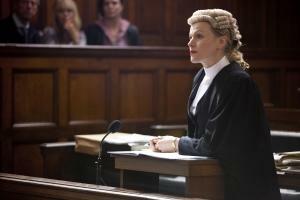 Maxine Peake stars as Martha Costello in Masterpiece Mystery! "Silk" on Thursdays at 9 p.m.
"Silk" is a modern, fast-paced legal drama following the conflicts, passions and intrigues of criminal law, starring Maxine Peak (Little Dorrit) and Rupert Penry-Jones (The 39 Steps) as rival barristers with very different work styles. Written by Peter Moffat (Criminal Justice).